This Saturday come out to The Pit, home of this year’s Last Man Standing competition, and contribute to the biggest event in NYC of the year. Victor Callender is hosting a box jam/barbecue/fundraiser for this year’s LMS this Saturday July 9th. Featuring skating from Joe Dedentro, Victor Callender, Robert Monegro, Alex Nunez, Mike Horbituak, Angelo Ferrer, Jordan Baez, Hyper Mike, Frank D’Angelo, and Christie Toledo. Featuring Jose Henriquez, Joey Zitelli, Pat Bernat, Jose Disla, Adam Caroselli, Victor Callender, Carlos Montenegro, Sal Zaso, Jeff Scott, Frank D’Angelo, and Angelo Ferrer. Filmed and edited by Angelo Ferrer. Yesterday we got a look at the second LRNY session and today we get a look at what went down during the first session of the summer. This edit is brought to you by the man himself Victor Callender. Check the edit featuring James Perez, Emil Marvin, and many more at the Coleman skatepark, Brooklyn Banks, and marble ledges in downtown Manhattan. Filmed and edited by Victor Callender. During the day, on the cleanly paved and cemented streets of the financial district—so oddly devoid of trash, doggie remains, and even cockroaches—you see the men and women of Wall street, with their six figure salaries and business suits. As trains, cabs, and ferries get filled to capacity by these rush hour commuters, a change takes place; cleaning crews and tipsy Staten Island girls begin to shuffle in for their evening affairs. Another group also makes its way in; slowly but surely, attracted by the pristine marble decor of the office buildings and the authentic grime of the Brooklyn Banks and Chinatown skate parks, the inline skaters emerge. 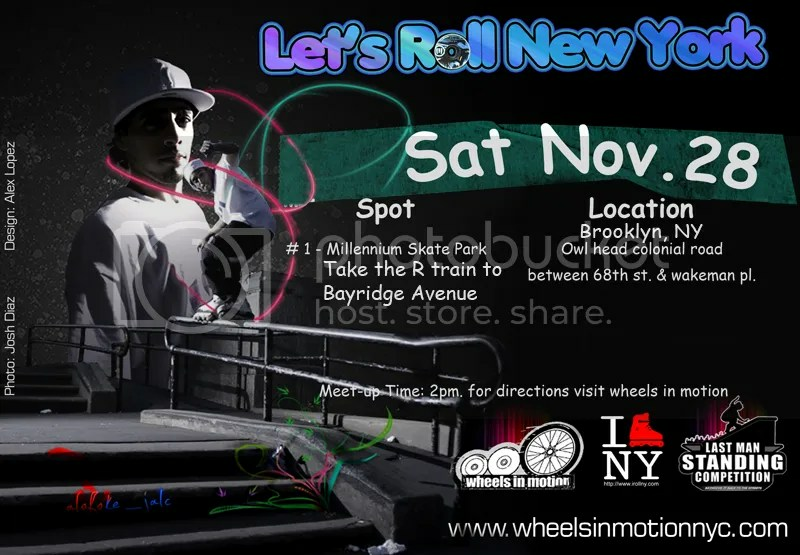 Lets Roll NY Session in Brooklyn Tomorrow! Time to work off those extra pounds we put on yesterday and session in Brooklyn, NY’s one and only skate park tomorrow. LRNY is taking place tomorrow at 2:00PM in Owl’s Head park at the Millennium skate park A helmet is most likely required to skate the park so don’t forget yours. Take the R train to Bayridge Avenue and walk to the park. More information and directions on the above flyer and below. Sunday’s LRNY Bronx session was more of a flash back then a normal meet up. Names like Brian Lewis, Hakeem Jimoh, Joe Dedentro and the usual Victor Callender and Jon Ortiz were all in attendance. It’s really good for any person to know their history but to be in the presence of people who pioneered your sport is something truly great. The session started slowly with people arriving with their sun glasses on, recuperating from the Saturday night hang over, and the Create Originals crew, Brian Lewis and Hakeem Jimoh, managed to be the early birds of the day coming all the way from Boston. Lets Roll NY Session Tomorrow! Bronx, NY! 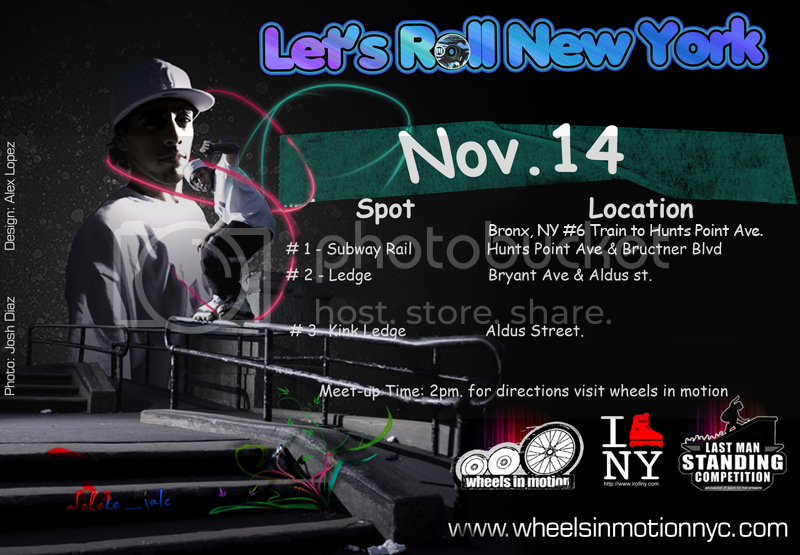 Sorry for the late announcement, but this week’s Lets Roll NY session will go down in the Bronx tomorrow! Take the #6 train to Hunts Point Ave/ Southern Boulevard. Walking directions from the train station to the first spot, the subway rail, can be found here. Session starts at 2:00PM make sure to be there! Lets Roll New York Session 12 Announced! Victor Callender’s 12th LRNY session has been announced and this time it’s going down in Queens, NY! With the announcement of the new session, Victor Callender also has launched the new Wheels In Motion site which has an already setup online map of where each spot is which is very helpful for anyone not familiar with the Queens area. Info is on the flyer above, take the #7 train to Vernan Boulevard and walk to 48th avenue where you’ll see a set of red ledges (viewable on the google maps link.) Come out and show your support and lets not let the winter stop us. Saturday is looking nice and sunny so far so make sure to be there because you never know what will be going down! Get all the info you need on the Wheels In Motion site. Yesterday Victor Callender hosted the Brian Scott memorial session where we had a huge turnout. Thanks to everyone who attended and who contributed to the fund raiser. Besides the massive amount of skaters that came out to show their love and respect for Cozmik, New York 1 came out and covered our session which they broadcasted last night. You can see the coverage here. 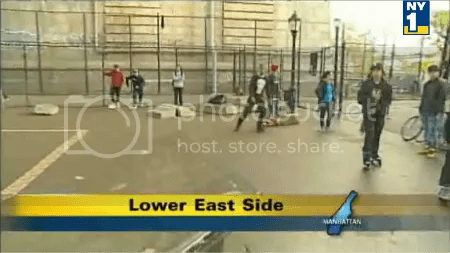 “Dozens turned out last night to celebrate the life of a well-known rollerblader…More than 100 skaters turned up at a Lower East Side skate park to honor the memory of their friend Brian Scott. The 18-year-old was a rising star in the world of urban inline skating. Friends collected donations to help out his family” NY1.